Removing Japan from the global equation of production and consumption could cause the second wave of the financial crisis. 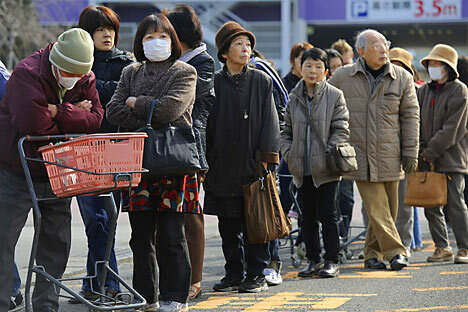 Experts are saying that the earthquake and tsunami in Japan are more than a human tragedy—the situation has destablized the global economy and marks the beginning of the second wave of the financial crisis. Japan, which along with the United States and the European Union, is one of the three major global centers of consumption is one of the major players on which the global economy depends. With this disaster, Japan has effectively been knocked out of the game. As a result, Russia faces much bigger problems than simply a shortage of Japanese cars. Over half of the Japanese car industry has been destroyed. Japan’s big three auto producers—Toyota, Honda and Nissan—have announced a halt in production due to lack of components. Mitsubishi and Subaru have also suspended production of cars at several of their facilities. Mazda and Suzuki do not have factories in the area of the country most affected by the earthquake and tsunami, but one way or another, every manufacturer now faces serious problems. In addition to difficulties with suppliers, the auto companies have lost established logistics and will have to dispose of thousands of manufactured automobiles that were awaiting export when this natural disaster transformed them into scrap metal. The auto industry is only the tip of the iceberg. Markets crashed as news from Japan poured in. Exchanges in the U.S. and EU were hit the hardest, but Russia’s RTS and MICEX indices also froze in the “red” zone of alarm (declining 1.01 percent and 0.68 percent, respectively). Insurance companies logically saw the biggest plunge and it’s possible that some of these companies might not survive. Shares in companies such as AXA, Swiss Re and Aviva PLC fell by two to three percent. And, as manufacturing in Japan fell off, so did the country’s need for industrial fuel. Oil prices took a dive, with the average price in New York dipping below $100 per barrel, and the falling oil prices dragged down the shares of oil companies. At the moment, what the country needs is to secure its food supplies, and the food factor is what will ultimately undermine the global economy this time, according to Vasily Koltashov of the Institute for Global Research and Social Movements. Speculators, who had been previously disappointed in currency machinations and switched over to oil trading, are now abandoning oil and focusing on food.